We believe everyone should sing. It makes you feel better! And singing together changes us from individuals into a community. That is why we are delighted to support our Singing Communities Ladywood choir. The group meets on Tuesdays in Ladywood and all are welcome, whether or not you have ever sung in a choir before. There is no audition and most members do not read music. 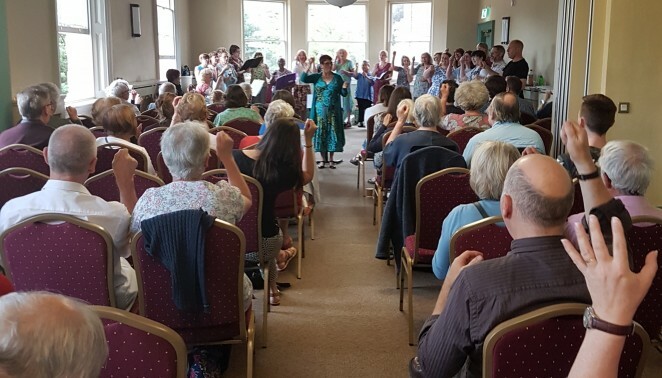 Rehearsals are led by Marianne Ayling, one of our Vocal Tutors and singers, and the group sings a wide range of music from around the world. The focus is on enjoying singing together. The group is invited to sing with Ex Cathedra from time to time, for example helping to lead the audience hymns at Symphony Hall in our Good Friday performance of Bach’s St John Passion in 2017, and gives its own informal concerts once or twice a year – though the audience should beware, they might have to join in!! Come along and try a rehearsal! For information about the rehearsal venue and dates, contact Myriam in our office on 0121 616 3412.